Much like enhancing the customer’s in-store retail experience with digital signage, the same principle applies in the hospitality space. Guests are constantly critiquing their visits at hotels and conference centers as poor service can result in a loss of recurring or referral business. Not only do guests expect exceptional service during their stay, they also want personalization and on-demand functionality in their traveling experiences. Guests’ desire for on-demand qualities for not only travel, but also most aspects in their daily lives depends on the availability of high-end technology. Most players in the hospitality industry understand the importance of engaging a technology-driven audience — with technology advancements prevalent, no company wants to be left behind. However, not every player is implementing technology within their space to create a modern feel and eye-catching visuals. Not only does adding digital signage to a hospitality space give a sleek and upscale appeal, but it also can significantly enhance the customer’s stay and experience. Use digital signage to display various concierge services like transportation arrangements, off-site reservation bookings, event planning and more so guests are constantly aware of services that are offered. 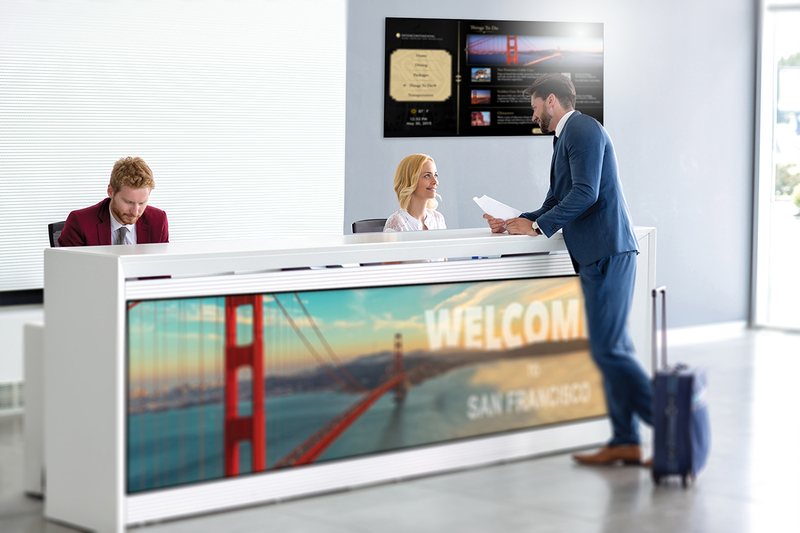 The vibrancy of digital signage messages will not go unnoticed in a hotel space, where guests expect to have that information readily available for convenience. Like most individuals nowadays, guests want to have information readily available. Digital signage is an ideal platform to portray information to keep guests informed at all times. Having critical messages for guests always available will ensure that they get the information they’re looking for without needing to track down hotel employees when in a time crunch. Give your hospitality space’s lobbies, reception desks, concierge area and rooms a sleek and modern feel with visual digital displays. Brilliant signage displays with engaging content, such as social media streaming, will not only intrigue guests, but it will also portray an impressive advanced aesthetic. Wayfinding capabilities portrayed through digital signage and kiosks are a means of directing guests onsite. Hotels and resorts are massive, and both first-time and recurring guests can get turned around in unfamiliar areas. Hotel guests will be appreciative of being able to get simple directions in no time. Visual digital solutions and displays should be a top priority of hospitality entities, especially as technology advances moving forward. Not only do digital signage displays look spectacular, but they also provide critical information that guests not only want, but need.